From 1916, all British men of military age could be called up for military service unless they had an official exemption. Perhaps unsurprisingly, some tried to get them through unofficial means. A trial at Old Street Police Court in 1918 highlighted the scale of the problem in Stepney and resulted in one young lady being sentenced to prison. While a huge proportion of the male population was in the armed forces (as we have seen before, by 1918 nearly half of London’s male voters were in the services), military service was not universal. Men were able to remain at home because their employment was important for the war effort, because they were unfit, because their personal situation (such as urgent family or business needs) meant that leaving would cause undue hardship, or (for a small number) because they held a conscientious objection to military service. In April 1917, there were 3.6 million men in the British Army, including 2 million actually serving overseas, while another 2.74 million military aged men had exemptions from service. Of the latter, 1.8m (66%) held exemptions due to being in ‘protected’ industries, half of those in Government factories. Another 779,900 held exemptions granted by the military service tribunals – which included 373,000 in ‘reserved occupations’ but not granted Government exemptions. In October 1918, 2.57 million men were working in reserved industries, including one million in munitions works, 500,000 coal miners and 400,000 in railways and other transport roles (compared with 2.1 million in the army overseas, 1.6 million of whom were on the Western Front). For those who were not automatically exempted because of their jobs, or who were young and liable to be ‘combed out’ of protected jobs when lower age limits for exemptions were raised, getting an exemption from the local tribunal could be vital if they were to avoid military service. The Old Street trial focussed on the office of Robert Abrabrelton, clerk to the Stepney tribunal, where his two assistants Miss Carter and Miss Terleshky were alleged to have given papers to men who were not eligible for exemption. The Old Street trial in August 1918 focussed on Ida Lilian Carter, a 19-year-old (in 1918) clerk in Abrabrelton’s office from summer 1916 to July 1918. She was the daughter of an engineering clerk and grew up in Poplar; in August 1918, her address was given as Marsala Road, Lewisham. The trial focused on papers given to men who had received exemptions in the past and were applying for renewal. It was the young ladies’ duty to look after these forms, which were prepared in advance by using stamps bearing Mr Abrabeltron’s signature and the address of the tribunal. It turns out that no record was kept of the number of forms issued each day and very little control was maintained over the signature-stamp (at one point it was kept in a locked draw, but apparently it was still accessible without the key). Counsel for the defence noted that “Both she and Miss Terleshky were good looking young girls and they had been flattered and cajoled by the young men who came to the offices and who wished to dodge the Army.” Carter had also, apparently, sent a fake exemption certificate to her brother “for the purposes of a joke he wished to play on another member of his orchestra” in Brighton. The brother was arrested, sentenced to a month’s imprisonment and then drafted into the army. The matter seems to have come to a head at the point at which Carter was sacked by the Tribunal anyway. She had already left their employ before the trial, apparently on the basis of “irregular attendance”. Abrabrelton told the court that “He had warned the defendant about accepting chocolates and sweets. She was told she would be dismissed, but her parents had intervened, and as he had a great respect for her father he had kept her on.” This rather makes it sound like he suspected that something dodgy was going on, but hoped that Mr and Mrs Carter would be able to get their daughter into line. Defence counsel appealed for lenience on the grounds of ‘her youth and respectability’, but the magistrate “said that the charge was very serious. There had been very serious results, and it was impossible to pass over the matter by a fine” and Carter was sentenced to one month’s imprisonment. Many men hoped to avoid military service during the Great War. While most sought out protected jobs or went through the official tribunal procedures, clearly some were inclined towards corruption to keep themselves out of khaki and blue. Apparently, all it cost in Stepney in 1918 was 2s 6d, some sweets and a bit of flattery. If British people think of Japanese fighter pilots, they probably think of the Second World War and the Zero long-range fighter aircraft, or even kamikaze. They certainly do not think of a young man in a Royal Air Force biplane. But Harry Fusao O’Hara was a Japanese fighter pilot, flying with the RAF in 1918. Harry Fusao O’Hara was born in Tokyo in 1891. As a treaty partner of the UK, Japan joined the Allies early in the war; O’Hara, though, seems to have decided to fight for the British rather than his homeland. First, he served in the Indian Army in the 34th Sikh Pioneers, the pioneer unit of the 3rd (Lahore) Division, which served on the Western Front in 1914 and moved to Mesopotamia in August 1915. It is not clear whether O’Hara served at the front with the SIkhs. Instead of going to Mesopotamia, though, O’Hara joined the Middlesex Regiment in December 1915 and did then go out to France, arriving on Christmas Eve. In August 1916, O’Hara was wounded in action. Although the records do not detail his actions, he was awarded the Military Medal in January 1917 and, when inspected by a Royal Flying Corps doctor, he was found to have shrapnel scars on his left arm, chest, left shoulder, right arm and right thigh. He had clearly – as the phrase goes – been through the wars. In March 1917, O’Hara transferred to the RFC as a 2nd-class air mechanic (the basic rank for RFC men – equivalent to his rank of private in the Middlesex Regiment). 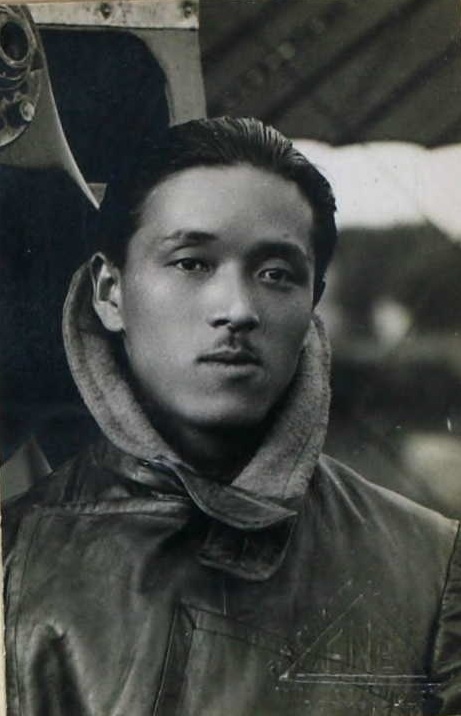 He was soon undergoing flying training, though, and living in London at 25 Fitzroy Square, a boarding-house run by Jukicki Ikuine, another Japanese man living in London. In 1911 Ikuine and his English wife had run a boarding-house entirely populated by Japanese men (servants, cooks and waiters), so perhaps his properties were a standard place for Japanese men to board. O’Hara qualified as a pilot on 21 July 1917 at the London and Provincial flying school in Edgeware, and was immediately promoted to Sergeant by the RFC. It is not clear where he was stationed between then and March 1918, when he was posted from France to the No 1 School of Military Aeronautics (in Reading), but at some point he became engaged to Norfolk-born Muriel M McDonald. They married in Lewisham in September 1917. In 1918, Sgt O’Hara went out to the front again to join No 1 Squadron RFC/RAF. Quite what his commanders and comrades made of this Japanese man with an Irish name we will never know. Given his proven bravery and obvious technical capability shown by gaining his flying certificate, it seems likely that his race held O’Hara back from becoming an officer. Nonetheless, the RFC and RAF accepted sergeant-pilots and O’Hara was able – again – to fight for Britain in France and Flanders. On 1 June 1918, O’Hara was again wounded and sent to hospital. This time he suffered a gun-shot wound in his jaw. Two weeks later (after treatment in Boulogne) he was back in England and sent to Queen’s Hospital in Sidcup, which specialised in facial reconstructive surgery. He was granted a month’s furlough in both September 1918 and April 1919, effectively leaving the RAF during the latter before being discharged officially a year later. He was awarded a war pension of 19s 3d per week from November 1919. Sadly, the hospital records on O’Hara are incomplete, only covering a return visit to Sidcup in 1923-24 to have a new set of dentures fitted – presumably to replace those made after his injury in 1918. The photos of his face don’t show the severe wounding experienced by other Sidcup patients (like HR Lumley), so it looks like he was one of the lucky ones among facial wounding victims. Harry and Muriel O’Hara lived on in London after the war, first of all at 39 Thornford Road, near Lewisham Park, and later at 32 Pemberton Gardens, Islington. In the early 1920s, Harry worked teaching Japanese at SOAS, but otherwise little record of their life remains. The National Army Museum’s collection includes a cigarette box given by O’Hara to a former officer of the 34th Sikh Pioneers in 1932 “in memory of World War One”, so he obviously maintained some links with his wartime comrades. When war came again, Harry O’Hara became an enemy alien after Britain declared war on Japan in December 1941; so too did Muriel under the laws of the day, whereby a woman automatically held her husband’s nationality. She reclaimed her British nationality in 1944, but he apparently remained Japanese. There is no record of his having been interned, so hopefully this decorated and repeatedly-wounded war hero of the Great War was allowed to live on in peace (from the authorities at least) in his house in Islington. Harry Fusao O’Hara died in Hampstead in 1951. A nation’s wartime armed forces really take all sorts. The RFC and RAF included men from across the Britain’s Empire, dominions and other allied and friendly nations. Harry Fusao O’Hara may well be unique, though, as a Japanese fighter pilot on the Western Front. In previous posts we have seen how some ‘alien enemies’ were attacked by their fellow Londoners, and how others joined up to fight for Britain. Others, naturalised citizens or British-born with parents who were aliens ended up as labourers in the Middlesex Regiment’s Alien Labour units. In 1916, Army Orders established two new battalions in the Middlesex Regiment. These would contain recruits who were British citizens but the children of immigrants from nations with whom Britain was at war; the men were promised that they would not have to bear arms against the enemy. The units were named the 30th and 31st battalions and they served only in the UK. Some additional similar Labour Companies were also formed in 1917 and served in France. The units were known (rather cruelly) by some as “The Kaiser’s Own”. Several Londoners served in the 31st Battalion – which ended the war based in Croydon. Hugo Max Norman Hotopf was born in Northumberland in 1881, the son of Hugo and Johanna who were German immigrants naturalised as British citizens in 1895. By the start of the Great War he was married, living in Lewisham, and had a son – William Hugh Norman Hotopf, born June 1914. Norman was working as a dye expert for the rather Germanic-sounding Badische Company in Brunswick Place near Old Street. In 1916 he appealed for exemption from military service at the Shoreditch Military Service Tribunal, explaining that he was a chemical expert whose work was helping the British war effort. 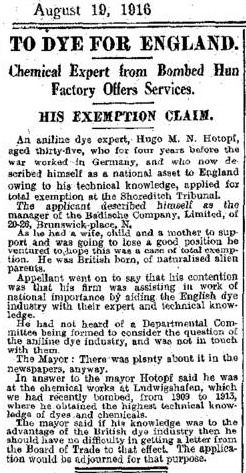 The Daily Mirror (19/8/1916) picked up on the story after Hotopf recounted his time before the war (in 1905-13) working at the chemical works at Ludwighafen, which the British had bombed in 1915. The fate of that appeal is not reported, but he was eventually conscripted into the 31st Middlesex. After the war, the Hotopfs continued to live in Lewisham, adding a daughter (Ruth) to the family in 1919. They retained links with Germany, though, with Norman junior spending part of his youth there before going to Cambridge University. In March 1938, Norman senior and his wife (then living in Forest Hill) attended a farewell dinner held for German ambassador Herr von Ribbentrop in London. They also went to Germany, where Norman senior died in April – in Bühlerhöhe, Baden-Baden. Norman junior became a prestigious professor of psychology. Oddly, a neighbour of Hotopf’s in Queensthorpe Road, Sydenham was also in the Battalion. Walter R Kinge lived at number 20, a few doors down from Hotopf at number 14, and served in the 31st Middlesex. Alois Frederick Pfeiffer was born in around 1889 in Bermondsey, son of Alois Pfeiffer from Bavaria and his English-born wife Emma (technically, she became German when she married Alois). Alois senior and Emma were licenced victualler’s assistants in 1901 – they worked in a pub – and at some point after her husband’s death in 1905, Emma became the landlady of the Leather Exchange Tavern in Bermondsey. When the Great War came along, two of Emma’s sons served in the British Army. Frederick Charles Pfeiffer served in the 2nd/4th London Regiment, which went out to Egypt in August 1915 and on to Gallipoli in October. Frederick died there in November aged 24. His elder brother Alois junior ended up in B Company of the 31st Battalion, Middlesex Regiment. 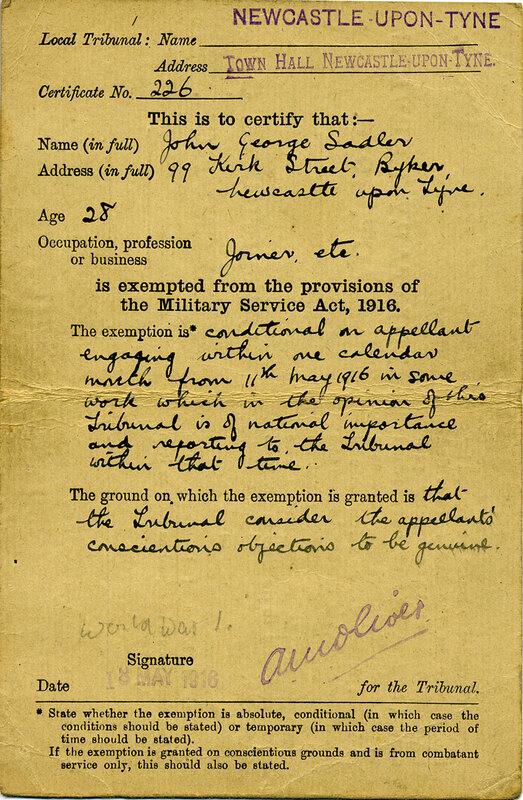 In February 1919, Alois junior was still in the unit and his mother made an appeal for his release on compassionate grounds. Frustrated by slow progress, Emma Pfeiffer went to her MP – Harold Glanville – who brought up the case in parliament. Eventually, Alois F Pfeiffer returned to Bermondsey and lived in London for several more decades. Unlike Hotopf and Pfeiffer, Edward Kehlstadt was actually born in Germany, in the town of Gebweiler, Alsace (now in France). 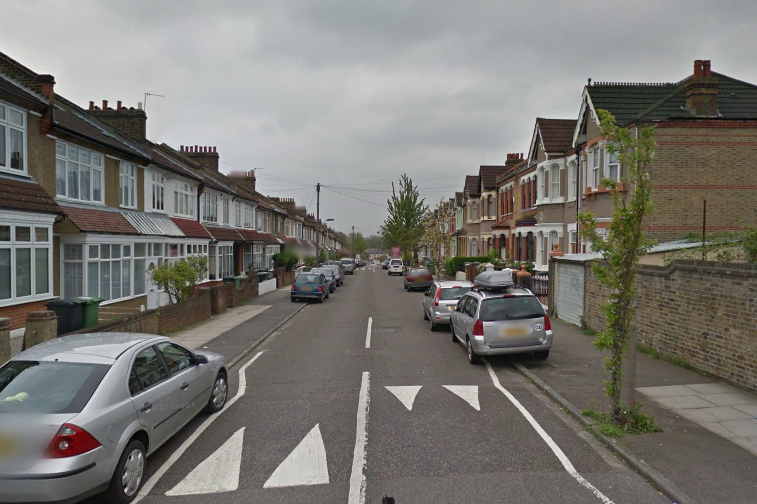 When he became liable for service in the British armed forces in 1916, he was a stockbroker’s clerk living with his English-born wife Blanche in (aptly, or unfortunately) in Berlin Road, Catford – renamed Canadian Avenue in 1918. Edward Kehlstadt joined the 31st Middlesex in March 1917. After training, he joined the 3rd Infantry Labour Company in France in June 1917; he served with them for more than a year. Following a spell of leave back in the UK in the summer of 1918, he went back out to France, but only until September 1918. After being admitted to hospital with boils, Edward Kehlstadt was sent back to England at the end of September and back to the 31st Battalion. A few weeks later, he died in Cavendish Bridge Voluntary Aid Detatchment (VAD) Hospital in Shardlow, Derbyshire, on 21 October 1918. A few days later, he was buried in Ladywell cemetery. Blanche Kehlstadt wrote to the War Office requesting a badge of the Middlesex Regiment as a memento of her husband’s service with the unit. Edward’s name appears on the war memorial at St Mary’s Church, Lewisham, where he and Blanche had married in 1909. These three men, two English with German parents, one German-born but naturalised as a British citzen, were all Londoner’s who served in ‘The Kaiser’s Own’. It is impossible to know, but interesting to ponder what their feelings were about serving in an army that was fighting their – or their family’s – homeland. Did Hotopf’s links to Germany make him reluctant to join up? Did Kehlstadt the Alsatian-Londoner feel German, English, or even French when he served in the Labour Company in France? Wars hold millions of stories about millions of men, women and children. These three men and their families had a different war from those around them, with closer ties to the enemy than most had they were not trusted to (or were sympathetically allowed not to) fight at the front, but still served their country.